Results of the events « CFO’s day» and «CFO’s working day». Last week, 29 and 30 October took place two events dedicated to professionals of financial services. The first one «CFO’s day» was devoted to techniques that can help professionals in their work. Throughout the day participants listened to speeches of leading experts in the area of economics and finance. 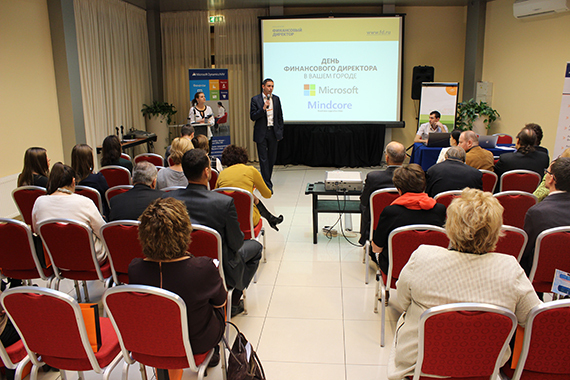 The workshop began with a presentation by Denis Ivanov, Mindcore CEO. In his speech, he talked about the role of financial officer in the company and the difficulties they face in their daily work. About the fact that with the passage of time and changes in the Russian business model management of companies all the better realize how important financial department to any organization. In addition, Dennis spoke about the latest tools provided by the companies Mindcore and Microsoft to increase the efficiency of financial services, and commented the upcoming workshop and the issues that will be discussed in detail during it. 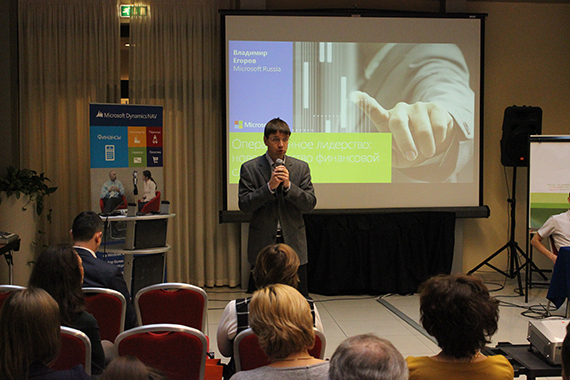 Vladimir Yegorov, head of ERP-solutions promotion, Microsoft Russia. Olga Shipkova, Laboratory “Computational Mechanics” LLC, CFO. Natalya Kuznetsova, “Java Management Company” LLC, CFO. Yulia Kolesnikova, Ariston Thermo Group, CFO. Throughout the day, experts Mindcore communicated actively with the forum participants and shared experiences. Both the organizers and participants of the event helped each other to learn more about the challenges and problems of the industry and the needs of financial services professionals. On the following day took place a workshop «CFO’s working day», during which each participant received useful information and engaged in practical cases on financial management. During the theoretical part, were discussed in detail such topical issues as working with the customers and suppliers, the schedule of cash flow, billing reminders, coordination of documents, as well as real time KPI’s and the implementation of these issues in the Microsoft Dynamics NAV 2015/2016. The event gathered more than 240 financial services professionals, and despite the significant number of participants, the atmosphere at the events was warm and informal, allowing all participants to ask their questions and to receive comments from experts in the financial management. During the events, due to the close and effective cooperation, many of the participants have established business relations with partners and with each other, as well as learned about the latest innovations in the financial management.